The chair's actual seat space is small, giving the sitter a feeling of being held. It was designed on a cube principle, with the intention of making a chair whose structure was plainly declared, rather than buried inside upholstery. The Grand Confort has complete clarity of design, and is a highly original solution to the problem of real comfort. It can be seen to have influenced many recent designers of ultra-comfortable armchairs and sofas, notably Mario Bellini, with his 1967 design consisting of big cushions held in relationship simply by a broad strap, slotted as a belt is slotted, through flat retaining loops. This idea of freely arranged upholstery has become popular lately, with various types of joined cushions forming flexible seating elements with and without a supporting structure. 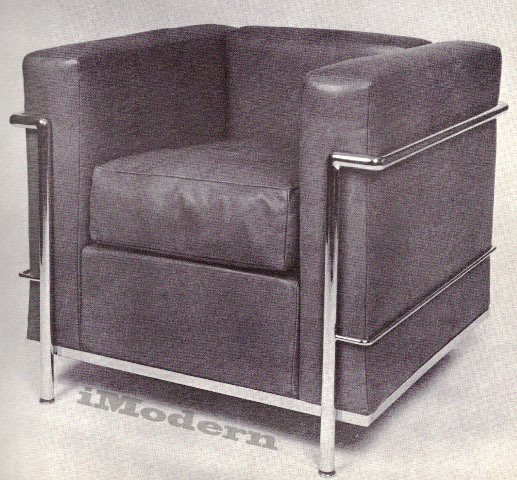 Indeed, Le Corbusier's ideas, with a radical new architectural logic manifested in methodically developed designs, produced many of the basic principles which showed today's designers the way towards 'free form' in furniture. He, more than any of the twentieth century pioneers of chair design, took the problem back to its most elemental stage, and re-thought the existing structural conventions. There is a wider version of this chair, which deviates from the original cube shape to give a more generous proportion. It seems more conventional in feeling, and unnecessarily large, considering the comfort of the cube version - a comfort that is unusual in such a small armchair. The external structure means that the upholstered elements are no more than they appear to be, and they are so designed that they do not need to be fixed in position. A rarity in the design of metal furniture is the use of frame elements varying in section according to their function. The bar running around the cushions halfway up the frame is very thin, because it simply works as a tension member, whereas the heavier top bar is actually a structural element connecting the legs. 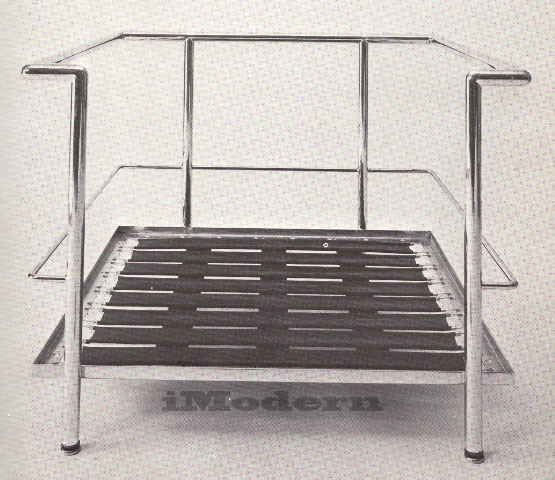 The frame below the seat is an L section, holding the mesh and making a tray in which the seat cushion firmly fits, wedged by the three vertical cushions sitting in the same tray on their edges. Instead of bending the tubular steel, Le Corbusier welded the corners where the sections of tube join, and ground them to an acute curve. The frame of the Grand Confort, showing the neat corner joins and the mesh seat support.